It was the first international ice hockey game ever played in Kenya. It was also historical because it was organized to call attention to the impact of Climate Change – in Kenya and around the world. The widely publicized game is part of a UN Environment initiative to use sports to rally governments and common citizens in defense of our planet. 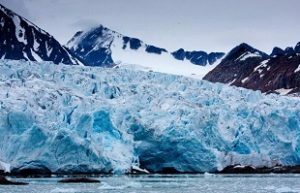 Hockey games are being held in dozens of regions around the globe – and after the games the players tell the stories of climate change impacting their communities This project will culminate in the Last Game – the first and last hockey game every played at the North Pole. But yesterday it was Kenya’s turn in the spotlight in support of the UN Environment Assembly. The Kenyan Ice Lions played a dramatic match against the LAST GAME All Stars – led by the Hall of Fame, World, Olympic, and Stanley Cup Champion – Slava Fetisov – UN patron for the Polar Regions. He led the visiting players, who came from a dozen nations – on a tour of the National Wildlife Park. He was on the verge of tears as described how unprecedented and destructive weather patters and human intrusion were decimating the lions – the mascot of his team – and the symbol of the soul of the Kenyan nation. The Last Game has already visited Finland, in the Save Pond Hockey popular tournament, with the participation of Sauli Niinisto, President of Finland . Future Last Games are being scheduled from Abu Dhabi to Argentina – from New Orleans to New Zealand… and in New York – in September to coincide with the UN Secretary-General Climate Summit. An ice hockey match involving politicians, Hollywood celebrities, athletes and public figures will take place at the North Pole in April 2020, First Deputy Chairman of the Russian State Duma (the lower house of parliament) Committee on Physical Fitness, Sports, Tourism and Youth Vyacheslav Fetisov said at a press conference in Russia’s Far Eastern city of Vladivostok on Monday. 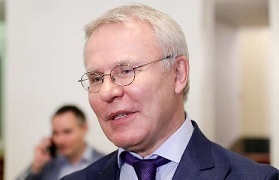 According to earlier reports, Fetisov, who is a two-time Olympic ice hockey champion and former NHL player, discussed the idea to hold ice hockey matches at the North Pole with Russian Sports Minister Pavel Kolobkov. 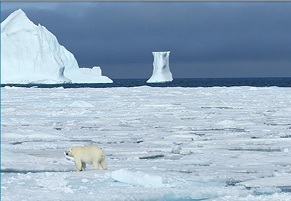 “The current global climate situation is unfavorable,” Fetisov told reporters. “I got the idea to bring together famous athletes, Hollywood stars, politicians and public figures to play ice hockey, sending a message to the world about how serious the situation is,” he added. “Today, the climate issue is what can unite people and get them to leave all political, regional and other kinds of conflicts behind… Unfortunately, we were unable to arrange a game this year due to lack of time but it will happen in April next year where we planned it [at the North Pole],” Fetisov emphasized. According to him, in order to arrange such a game, coordination with environmentalists would be needed. As for now, the organizers have secured the support of the global academic community and mapped out the logistics. “Yet, we haven’t had enough time to bring together the celebrities,” Fetisov noted. Kontinental Hockey League (KHL), the international ice hockey league, has appointed The Agency Partnership as its first retained international PR agency to support its expansion into new markets. KHL was created in 2008 to develop ice hockey across Europe and Asia. The 11th KHL Championship, which began in September, is contested by 25 teams from Russia, Belarus, China, Finland, Kazakhstan, Latvia and Slovakia. Last month the first regular season game was held in Zurich, and the league plans to move further into Western Europe, including the UK. The Agency Partnership was founded in February this year by former MSL client director and Ogilvy head of media and entertainment Blair Metcalfe, with a core team in London supported by a network of independent partner agencies and more than 600 consultants around the world. The agency’s brief for Kontinental Hockey League is to carry out media and influencer engagement and global monitoring, to increase awareness of the sport and attendance at games in key European and Asian markets. Other recent wins for The Agency Partnership include electric bicycle company Volt, and Vinci UK Developments, which appointed the team on a stakeholder relations and integrated consumer, public affairs and corporate communications brief for developments across the UK. Team ‘Olympic Athletes From Russia’ has transformed into team ‘Olympic Boozehounds From Russia’ awfully quickly, and the bender isn’t over yet. Less than a week out of the PyeongChang Games where a group of Russians captured men’s hockey gold, playoffs in the country’s top league are set to begin. Two of the clubs comprising the majority of Team OAR in South Korea — CKSA Moscow and SKA Saint Petersburg — are slotted to face off against Sparktak and Severstal, respectively, in the opening round, but the KHL is reportedly postponing the start of both series. For a very legitimate reason – if you ask me. Powerhouse No. 1 overall seed SKA Saint Petersburg, which went 47-5-4 during the KHL’s regular season, featured 15 players on Russia’s Olympic team, including former NHL All-Stars Ilya Kovalchuk and Pavel Datsyuk, and gold-medal game hero Nikita Gusev. Second ranked CSKA Moscow boasted eight players on OAR’s gold-winning squad, including Nikita Nesterov, Alexey Marchenko, Mikhail Grigorenko, and Kirill Kaprizov — who potted the OT winner against Germany in the final game. Both behemoths are on a collision course to the KHL finals, so why not delay the inevitable in the name of a good hangover. Leh (Jammu and Kashmir) [India], Feb 8 (ANI): Attempting a Guinness Book of World record for playing Ice Hockey at the highest altitude, a two-day tournament was organized at Chibra Kargyam in Ladakh’s Changthang region. As many as six teams, including five international teams from Canada, Germany, Russia, the USA and India, participated in the tournament. The tournament, which was started yesterday, was jointly organized by Ladakh Winter Sports Club (LWSC), Hockey Foundation and Lalok Winter Sports Association. Tundup, a member of Ladakh Winter Sports Club (LWSC), echoed similar views and said that it is a proud moment for the entire country to host such kind of event. “I am very happy that here the matches are being played for the Guinness World record. Here five overseas teams have come and there is one team from Ladakh. It is a big achievement for us to organize such kind of event in Ladakh. It is an honour for the entire Singey Lalok area of Leh district to have such event. It is a proud moment for our state and for our country because I believe such kind of event has never happened in India. I want to thank all the ministers of the state for supporting us,” he told. Meanwhile, Anthon, who has been coaching ice hockey in India for five years now, revealed that they were planning the Guinness World record match for almost two years now and hoped to see many more events like this in future. “I am from Canada. I have been coaching in India for five years. 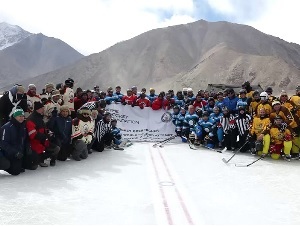 We have been organizing and planning this Guinness World record for almost two years now.It is such an amazing day for Canadians here those have been involved in the ice hockey in Ladakh. And all the Ladhaki people here, I am happy that they are joining and that they can enjoy this beautiful moment in the history of ice hockey in India. I hope in the coming years there will be more tournaments like this,” Anthon said. Located at a distance of 160 km from Leh, the natural ice hockey rink is at the altitude of 14050 feet above sea level. This International standard ice hockey rink is certified by Geological Survey of India. Days after losing his role as general manager, Mike Keenan has now been relieved of his coaching responsibilities by Kunlun Red Star of the KHL. Following nine straight defeats, which places them near the bottom of the Eastern Conference standings, the 68-year-old will remain as an executive member on the team’s International Advisory Board. Former NHLer Bobby Carpenter will take reins behind the bench on an interim basis with fellow ex-players Cliff Ronning and Igor Kravchuk staying on as assistants. “Mike Keenan has done a great job for several months,” said Kunlun president Raitis Pilsetnieks via SovSport (translated). “He formed a completely new KHL team, and also took an active part in building the entire club structure, which is part of a large-scale project for the development of Chinese hockey in the run-up to the Winter Olympics in 2022. Kunlun responded well to the news by snapping their nine-game losing streak with a 4-3 overtime win against Amur on Sunday. Keenan, who was the first coach to win championships in the KHL and NHL, joined Kunlun in March 17 months after he was canned by Metallurg Magnitogorsk, with whom he led to a Gagarin Cup title in 2014. So will we hear Keenan’s pop up whenever the first NHL head coach gets fired this season? He’s been out of the NHL game since 2009, but that never stopped general managers from bringing in a retread. Hey, how about a Philadelphia reunion? OK, that’s probably a pipe dream. But given Keenan’s recent coaching history, it wouldn’t be a shock to see him resurface behind a bench elsewhere in Europe. On a recent Friday evening, as prayers from nearby mosques blared over loudspeakers and the sun dipped below a horizon dotted with ancient churches, the lights flickered on at a municipal hockey rink in a working-class neighborhood of this city. Within minutes, 50 boys and girls on Roller blades and in colorful uniforms — nearly all of them Arabs — descended on the rink to spend the next two hours practicing a sport more associated with frigid Montreal or Moscow than the arid Middle East. These are the Nazareth Tigers — the only Arab ice hockey franchise in Israel. Hockey was brought to the country in the 1980s by Russian and Canadian Jewish immigrants, and today there are about 15 professional and amateur hockey teams organized under the Ice Hockey Federation of Israel. Twice a week, Milzman drives to Nazareth, Israel’s largest predominantly Arab city with about 90,000 residents, so he can coach his budding hockey players. He also takes them once a month to Metula, Israel’s northernmost town on the Lebanese border, where the kids can play on ice instead of using in-line skates to simulate the game. Milzman’s hockey coaching partner is Ramez Lahham, 42, a software engineer and Nazareth native whose son, Neal, got him into the game. 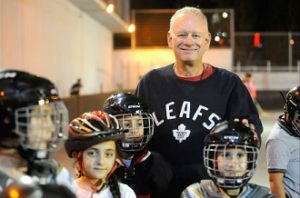 Lahham educated himself about coaching hockey by watching YouTube training videos and making friends at the Canadian-Israeli Hockey School in Metula. Over the course of five years, the Nazareth Tigers have grown from 15 children to about 55, including 16 girls, ranging in age from 7 to 16. The program costs about $30 per month and involves two to four hours per week of training. Milzman shares that philosophy. It’s one reason he was drawn to the Nazareth Tigers in the first place. Milzman, a die-hard fan of the Toronto Maple Leafs, was born in Washington, D.C., and raised in suburban Maryland. He also lived in New York, Los Angeles and Virginia, but acquired his love for hockey during 14 years living on and off in Vancouver, Canada. A former health care executive, Milzman was inspired to make aliyah, or immigrate to Israel, by his great-grandfather, who was sent by Baron Edmond de Rothschild to teach Hebrew to immigrants in the Galilee town of Zichron Yaakov. “My grandmother and an uncle were born there, so I always felt a connection,” Milzman said. He and his wife, Carolyn, made two pilot trips to Israel and then moved for good on July 7, 2014 — the first day of Operation Protective Edge, Israel’s war in Gaza. They settled in the Galilee town of Karmiel as part of the “Go North” program run by Nefesh B’Nefesh and Keren Kayemeth LeIsrael. In addition to coaching the Tigers, Milzman teaches hockey to children in the Arab Galilee village of Ras al-Ein and works 20 hours a week for SportSkills coaching baseball at schools and community centers throughout the Galilee. Majd Zaher, the Tigers’ goalie, has been playing hockey for six years. A husky 14-year-old who plans to study physics and chemistry in college, he said his mother saw a Facebook post about the squad and encouraged him to sign up. Hockey also allows the Tigers to travel. Besides playing other Israeli teams in Nes Ziona, Rishon LeZion and Metula, a few lucky teammates recently went on an extended tour to Vancouver, Calgary and Winnipeg in Canada, as well as Pittsburgh and Washington, D.C.
Nazareth’s municipal government spends about $5,700 annually to maintain the hockey program. Substantial help also comes from Toronto philanthropist Sidney Greenberg, who bankrolls ice time at Metula’s Canada Center, and from Ahmad Afifi, a Nazareth bus company owner who transports the team to Metula for free once a month. The Nazareth rink was financed by Detroit philanthropists Irwin and Bethea Green. Hockey is an expensive sport, especially in Israel. Basic gear — including helmet, hockey stick, gloves, in-line skates, and knee, chin and elbow pads — easily can run about $850, according to Raji Srouji, director of sports for the City of Nazareth. But Srouji, a former professional basketball player and coach, says hockey is a wise long-term investment for his city. Just ask Denis Superfin, the 15-year-old son of Russian immigrants who lives in nearby Nazareth Illit, which is 80 percent Jewish. Denis doesn’t understand Arabic, but that’s OK because Milzman coaches him in English and Lahham in Hebrew.